My elder daughter is a recent convert. I mean she is almost a convert from a non-vegetarian to a vegetarian. She refuses to eat most fish except salmon. She doesn't want to eat meat on two consecutive days.She eats her eggs with no enthusiasm. In a family like ours, this creates a difficult scenario. All the more because she has gone from a "no-fuss" eater to a somewhat "finicky" eater these days. She doesn't like to have just Dal & Rice or just veggies and rice either. In our family "finicky" eaters are assuaged with an omlette on the side and will eat anything with that option. This doesn't work with S though. She eats her broccoli and carrots with a dip but when served with rice all she wants is Paneer. Her Didun(my Mom) is party responsible for this. When she was visiting last year and Big Sis S refused to eat fish or meat, my Mom in a mode of panic that the child is not getting any protein took to feeding her Paneer. And not any store bought Paneer either. Every other day my Ma would make a little chhana or chhena(home made paneer) just for her and then she would shape them in small flat discs, fry them to a golden brown and make delicious gravy with them. This is a Bengali favorite and is called "Chhanar Dalna".The homemade paneer is super soft and soaks up the delicious slightly sweet gravy in which it sits, making it anyone's delight. With Didun back in India, such delicacies are a luxury and though my Ma insists that I could take time out and make some "home made chhana" and chhana'r dalna for Big Sis S, I pretend not to listen and go buy Paneer instead. Big Sis S has complied and eats this store bought paneer. She has Paneer on most week days and then she takes a Paneer Pualo for lunch almost one day every week. At school when her teacher asked her what she was having for lunch, she figured she didn't know English of Panner and so said it was chicken instead. With Paneer (Indian Cottage Cheese) and a bowl of plain yogurt as the incentive, she pretty much eats all other veggies on her plate. Everyone has a Palak Paneer recipe and I myself have tried and tweaked several. This tweaked version of the old favorite is the the one I love most. It is nice and creamy and comes with all the goodness of green spinach and white paneer. S too eats it up without a murmur about the greenery. Prep: Cut almost 12 oz of Paneer in small cubes. There were about 28-30 paneer cubes. Trivia:The ruling aristocracy in India from 1500 until the mid 19th Century was of Turkic, (Central Asian), and Persian origin, and it was they who introduced paneer to India. Sandeepa, diduns are meant for that, to spoil their grand daughters. DD2 who was an independent refuses to eat by herself after my mom left. The palak paneer look so good. I am not very fond of this dish unless made by someone else. My mom was very shocked when my son said he didn't like fish or meat! She blamed me :( Somehow, she made my son to eat fish, still he loves it! Vegetables are very hard for him! 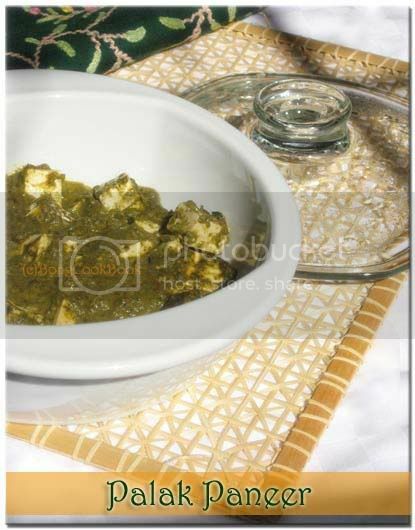 Palak paneer looks very tasty, I should try ur version! Palak paneer looks delicious, San! I like the kasuri methi addition too. Little S is getting fussy, huh? But looks like you've figured out the permutations and combis that work for her :) I don't think I've ever had freshly made paneer before. I can just imagine that being soft and yum! Palak Paneer looks so yum, it is our fave and yes, we always eat that with rice too. There is one best product called SWAD Palak Paneer and Paneer Makhani, Trisha LOVES those. She has instructed me to buy her those whenever I go to Indian store and give it to her in the college dorm,so she can have it Microwaved. There is no chance in heck my kids will opt for vegetarianism! Hahaha! Oh btw, I loved your Palak paneer pic.. with that shawl and mat!! DO you alter the html code to get a big size pic? Have you tried sneaking in fish in her diet as maccher chop? how grandparents spoil their kids :)and justifiably so ..
iam imagining the paneer dalna, soemthing my didima made n taught me too:)) cant ever go wrong with Palak Paneer .. I'm used to non fried paneer in PP as in most Delhi restaurants(and the homes where I've eaten)that's how it was. The paneer here of course is a different story and I have yet to come up with a satisfactory PP recipe, yours looks mighty tasty, will try. I'm salivating at your description of Paneer Dalna. Can you post it please? I'm on a no-carb diet :D so can eat that. Yayyyyyy! And I have no comment on the kids. I have no idea how you mothers deal with them, really! My husband's fave dish! I make it slightly different, without adding milk. But either ways, I am sure it tastes great! I prefer home made to restaurant - style palak paneer! I guess that's a package comes along with mom's:). I usually add cashew paste at the end instead of cream. Palak paneer is sv's fav. I boil the spinach, puree it and then proceed with the rest of the stuff. We had friends (non-veg) who were living in a vegetarian's house for rent. They would feed their daughter chicken but tell her it's potato so that she wouldn't out them!!! Grandmas are for these things. You know myself being a poor eater my grandma would make little rice flor to make rice noodles at home when I was a kid. The same happens when my elder one asks for a poori in the evening and amma makes them in a jiffy. Once she made a whole bowl of Gulab jamuns on a Sunday evening having my elder one taste just a bit. He's that bad :( The palak paneer makesme drool and its one of long awaiting recipe in my todo list. Hi Sandeepa, Thanks once more for a good post. Sympathies dear sympathies.... Feel better, as many of us go through these ones. Believe me I am always sandwiched between my son refusing to eat out in a Chinese joint and my husband, who is currently into an experimenting mood. My son, who is going to be 12 in July, now prefers a 'thali'/ bento/ platter kind of spread . Therefore every eating out is to be 'preceded by' a 'letz talk thru this one' session. On the face Fish is a no-option. But, till now, finally eats a fish meal, on one week night and on 2 meals in the weekend. Palak paneer however is my favourite, hence a big thank you. 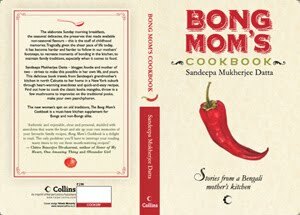 Will look forward to your chhanar dalna recipe. you took away all my illusions! i was hoping the no-fuss eaters stay that way forever! palak paneer is my all time fave! Trisha comes home on every weekend ? Maccher Chop, she will eat at other people's house but not at home. I guess it is a phase, she will even eat shrimp at other people's home but not at her own. Thankfully S is still pretty enthu about all kinds of eating out. She doesn't like Thai too much but we go to a Thai place so often that now she has complied, she eats the appetizers and a pineapple fried rice. Oh no...I owe my mother in law an apology for all the grief I caused her by rebuking everytime she said Ponir. I guess every kid has this passing phase and fish pieces ekto garam -garam fry kore khabao , tumi weekend e try korte paro , jokhon tumaar kache or sathe samay thakhe ..may be tumi oke nijer choto balakaar ekta doto golpo shunate-shunate fish khababar chesta korte paro ..okhane paka mach(rui/katla) paba jaye ? My little one is also fond of eating paneer opps ponir hehe..
ami palak ke ekto boil kore , puree kori ,kom samay e hoye jaye ,agey na boil kore kortaam ..kinto taste ta dekhlaam boil kore korle bhalo hoye..kasuri methi diye obosho try kori ni.. I don't boil spinach but I blanch it. Actually since I use baby spinach, I put the spinach in hot water for a few minutes and then saute it. Sandeepa, I tried your recipe today and I loooooved the outcome. I actually had guests, and they loved it too. Thank you! The only changes I made: I added the palak without blanching them and let them wilt in the container (I am lazy!). The kasoori methi was a great idea...gave it some kind of depth. You are, as usual, mu favorite. I tried out ur version of Palak paneer and its very very good...thanks. I tried your recipe and it turned out very nice. This is by far the best recipe I've found for palak paneer. So delicious that I am now regularly making paneer at home just so we can enjoy this dish again. Thank you for yet another wonderful recipe. This was a true success .. Loved it!! Nice recipe.I truly love this. I would like to thank you for the efforts you have made in writing this article.I am hoping the same best work from you in the future as well .Thanks for taking the time to share this . I would like to thanks for providing such valuable information to us. Keep Posting. Thanks for posting helpful information. tomar recipe aj obdhi shob hit. Even compared it with the big-wigs, way better than them. even compared it to the bigwigs, way better than them.